Her heart will melt like chocolate in a double boiler. If you're short of cash next Valentine's Day (or you're unable to justify the ungodly prices charged by Godiva), make your own damn chocolate covered strawberries. It's one of the easiest and most delicious things I've ever made. Buen provecho. 1 lb. Strawberries, washed and well dried. If you can find them with stems attached, you're a better man than I. Float two heatproof bowls in two separate saucepans filled with an inch of water. Bring water to just boiling and turn the heat off. Dump dark chocolate into one, white chocolate into the other, and stir to melt. Dip strawberries in dark chocolate and place on wax paper. 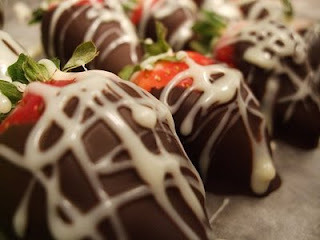 After all strawberries are dipped, dip a fork in the white chocolate to create neat looking drizzles. Have tissues ready for when she cries at how romantic you are. Remind her during next football season.